And humans lacked the tools for mass destruction. Paying tribute to fellow beings with place names. And making money from his flesh and blood. Golders Green, Swiss Cottage, Crystal Palace, Bank…. Elephant and Castle, Burnt Oak, Colliers Wood, Fairlop. While the heavens despaired over man’s Free Will. And concrete, material ‘values,’ were preached – and flourished. Heathrow, Wood Green, Oakwood, Southfields…. Chancery Lane, Knightsbridge, Manor House, Morden. Hurtling towards the End of The Line. 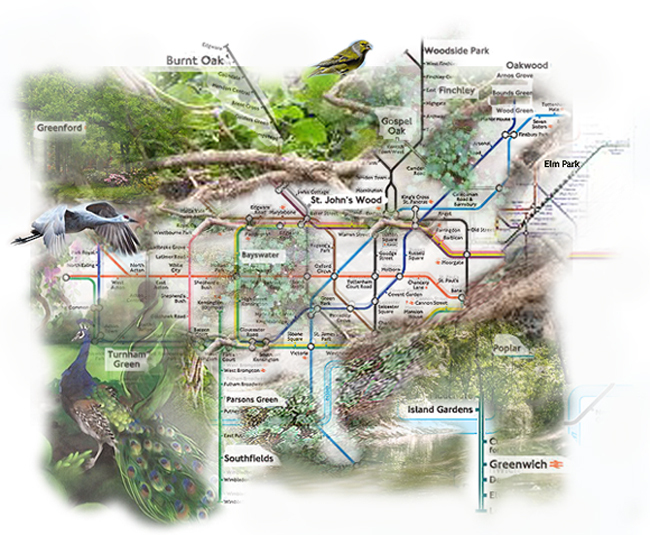 This entry was posted on 9 October, 2014 in homepage and tagged capital indifference, Claire Palmer, decimating habitat, ecology, Heidi Stephenson, London, mass extinctions, political poetry, urban development, urbanisation. Bookmark the permalink. Nice work, great idea, love this. A beautiful work of art, cleverly written, a masterpiece I would say. Well done Heidi Stepenson and also to Claire Palmer for the beautiful illustration. Thanks for such a lovely comment, Lara!